The topic of our weekly NY1 show is just what you need after yesterday’s binge: dark chocolate. We took a trip to Mast Brothers Chocolates on North Third Street in Williamsburg, where the siblings behind the city’s first true bean-to-bar operation have just expanded their factory by 3,000 square feet and hired Finnish pastry chef Vesa Parviainen to run their new test kitchen. Earlier this year The Mast Brothers sailed to the Dominican Republic to buy beans, and Edible Brooklyn got to tag along. The topic of our weekly NY1 show is just what you need after yesterday’s binge: dark chocolate. We took a trip to Mast Brothers Chocolates in Williamsburg, Brooklyn, where the siblings behind the city’s first true bean-to-bar operation have just expanded their factory by 3,000 square feet and hired Finnish pastry chef Vesa Parviainen to run their new test kitchen. Parviainen’s now responsible for turning their intensely flavored single origin chocolates–they’re all at least 70 percent cacao—into a range of sweets that reflect the terroir of the brothers’ respective bars. (Our favorite last week? A shortbread wafer sandwich held together by a ganache made from their super smoky Papua New Guinea bar. 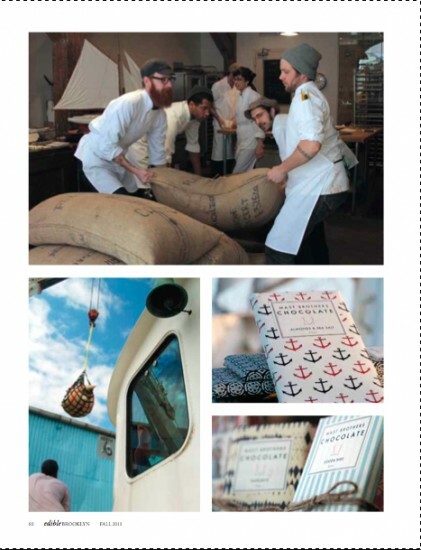 The segment was of course inspired by the cover story in the current issue of our sister magazine Edible Brooklyn, where a photographer tailed the brothers Mast on a boat trip to buy beans from a cooperative in the Dominican Republic. You can see those beans being made into Conacado bars at the lovely shop in our NY1 piece (which airs today and again on Sunday; you can also watch it online here) or in person if you take the new tour of the expanded factory. Just don’t try to go today; they’re closed today for the Thanksgiving holiday. Hey, even Williamsburg Willy Wonkas need a break every now and again. Pass the Rolls and Praise the Host; It’s Thanksgiving in Manhattan.